Best Summer Concert of 2010? Most everybody who embellishes the summer season remembers their vacation period by the great concerts which they attended. Seems this summer season has been packed with more major tours than recent years. Now days one must carefully pick-and-choose which shows to attend depending upon their budget. As most are aware, there's only so much entertainment dollars to go around. With concerts being so expensive and so many of our favorite artists coming to town, I'm shaking my piggy bank upside down trying to salvage all my bucks. But I don't mind telling you, just recently I attended one of the best concerts that I have ever witnessed. And you know what? After purchasing several tickets at a hefty price, the concert was worth every penny! 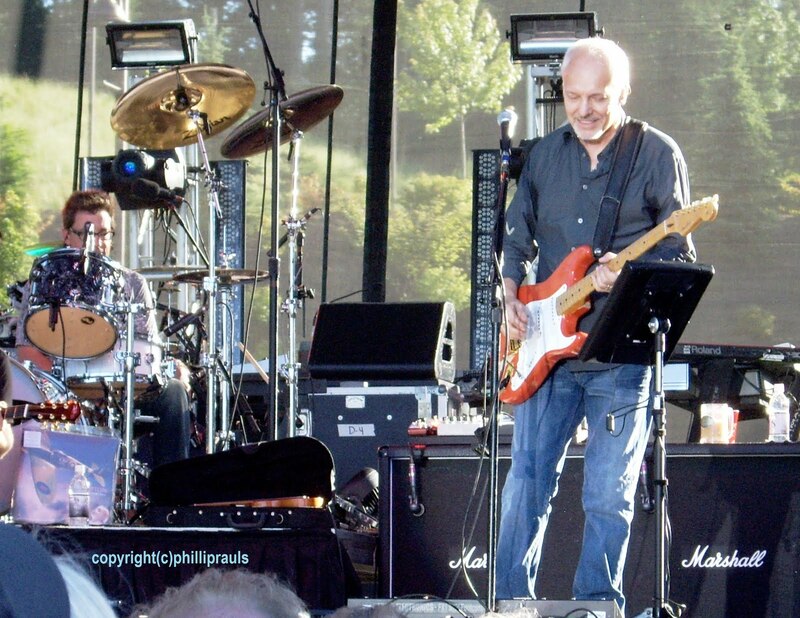 Without further ado, a concert billed as a 'double-headliner' show located at The Snoqualmie Casino just outside of Seattle featured two premier British Super groups, YES and Peter Frampton. Plus, it was an outside concert with a scenic backdrop of the beautiful Cascade Mountains. Man-oh-man! I was definitely in my own element and had to pinch myself for a reality check. Sitting in the ninth row and located dead center of the stage I was witnessing two of my all time favorites. Up first was the great Peter Frampton who opened the show. Yet, when he took the stage, my eyes literally popped-out of my head. It appeared that Peter Frampton wasn't the same image of the young superstar that I'd remembered from his classic album covers of the 70's. Somehow he looked a little different. The Peter Frampton that I'd remembered had this long shoulder-length blond hair and a huge boyish smile. But not any more. I had to study his appearance for a moment and try to re-adjust my premonition. Now in the 21th Century, it appeared that he still maintained the boyish smile but might have lost some of that long flowing blond hair. Not that there's anything wrong with it of course. Yet with all things considered, that was over 30 years ago and it seemed I was still time-locked into that dated vision. Much has transformed from that era and now that I think about it, I wasn't the same-looking yokel from the 1970's either. So there you go. After making that rude adjustment and putting the time changes into proper perspective, I was back on the same page as one of the great rock stars of all time, Mr. Peter Frampton. Frampton's performance was filled with loud roars from the audience and flawless versions of his catalog including; "Show Me The Way," "Lines On My Face," "Baby, I Love Your Way" and the timeless hit, "I Can't Stand It No More." Peter Frampton's backup group was superb and included Seattle band member Dan Wojciechowski. But when Frampton performed the homegrown classic, "Black Hole Sun" originally sung by Soundgarden, the crowd responded with a mammoth applause. Frampton's charm could be felt in every seat as he made the connection by telling stories between each song. He spoke of the recent flood in Nashville which destroyed all his band's equipment and how special this tour was to assemble after experiencing such a major set-back. Throughout his commanding performance Peter Frampton flashed his pearly whites and displayed a remarkable sparkle in his eyes that could be viewed all the way to the back row. After his performance, he mingled backstage with YES band members as seen here with long time friend and associate YES drummer, Alan White. As the afternoon proceeded, the sun began to set behind the mountains and a cool summer breeze cast itself across the arena. It was almost like the nice weather had been choreographed while rescuing the audience from a hot afternoon scorcher. Silence began to spread through the audience as the stage lights went down. Softly in the background the YES theme song began to play as people scrambled from the aisles and into their seats. Taking the stage were veterans of over 40 yeas in the music business and the undisputed pioneers of the Progressive-Rock movement...YES. From my viewpoint I was thrilled beyond comparison as I had worked with the band dating back to the late 60's and early 1970's. 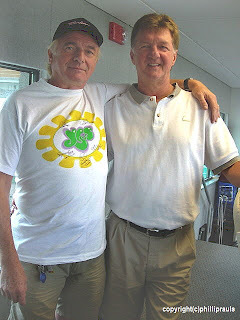 To me this was somewhat of a homecoming as I had developed a longstanding friendship with band members over the years. This concert brought that bond full-circle and I was anxious to make a connection with band members and their music. 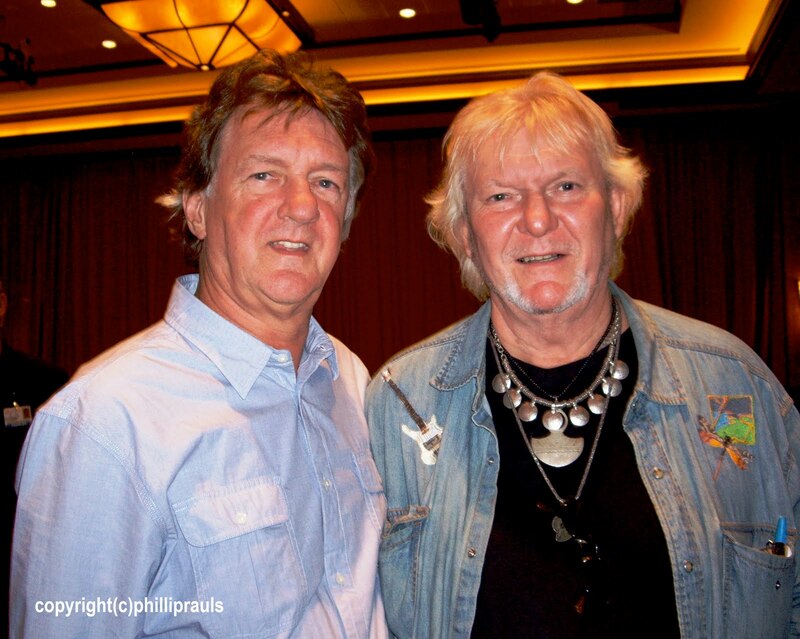 Seen here are legendary YES drummer, Alan White & myself, Phillip Rauls former Atlantic Records Artist Relations & Regional Promotional Manager. 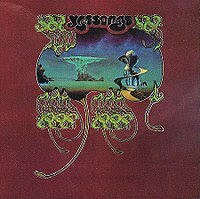 In looking back, perhaps no other band has remained as consistent and true to their music while touring the globe like the group YES. 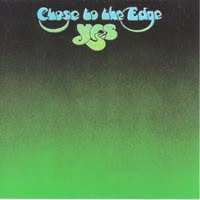 Their music has been coined everything from Classical-Rock to Art-Rock to Symphonic Rock to Prog. Yet all categories aside, their songs have always gone through a series of complex changes which, in itself, is precisely what's so appealing about their music. Although the band has released over 50 record and video albums, not always have they made radio friendly records. Sometimes the band's compositions were very lengthy while making airplay difficult. But there was always an Atlantic A&R executive available to edit their songs into shorter versions to accommodate radio demands and receive desired airplay. In the early 70's when popular music was transitioning from dance music into music for the astute listener, YES broke all the traditional rules while their melodic sounds stimulated the mind rather than activating the libido. As a former Memphis Music promoter, marketing the band sometimes got rather adventurous as converting that mindset to the broadcast media was an uphill battle. At times I was chastised while carrying that banner and told to grab a number and stand in line. But YES continued to produce outstanding albums while touring the U.S. relentlessly. As mainstream radio evolved from hammering away with leftover hits from yesterday...I was knocking on their door while lobbying for airplay with brand new albums by the up-and-coming newcomer...YES. Back to the YES concert at the Snoqualmie Casino and much to the delight to the audience, the band opened with their powerhouse songs, "Yours Is No Disgrace," and "And You And I," and "Perpetual Change," and "Roundabout" and "Starship Trooper" followed with "I've Seen All Good People" while never missing a beat. The lighting and sound were superb as the crowd cheered with overwhelming approval. The current band lineup sported a new look while joining original YES members, Chris Squire (seen below), Steve Howe and Alan White. New at keyboards was Oliver Wakeman, the son of longtime keyboardist Rick Wakeman. 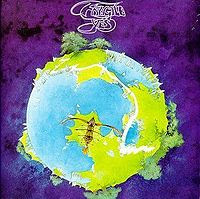 Missing from this current tour was original vocalist Jon Anderson who was at home suffering from respiratory problems. On this summer tour of 2010, Anderson was replaced by perhaps the band's next generation singer, Canadian Benoit David. We certainly hope Jon Anderson recovers from his complications and returns with the band at some point as he is a crowd favorite. Yet, take nothing away from enormous talent of Benoit David as he preformed admirably in Anderson's absence. Considering the extreme difficulty of singing the high-pitched notes combined with the complicated changes set by Anderson's vocal legacy, newcomer Benoit David nailed every pitch and sang with impeccable precision. And that accomplishment is certainly not an easy task. 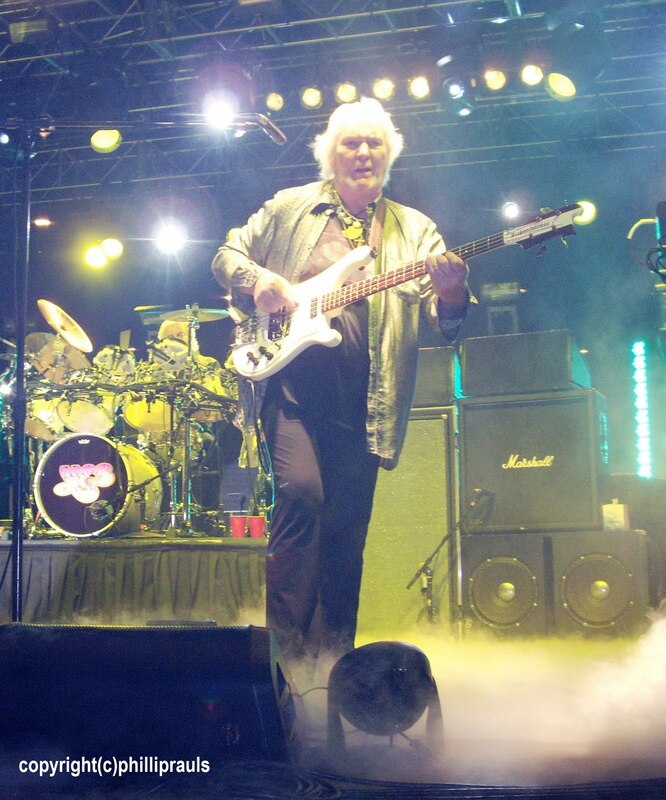 On the traditional YES standards such as "Owner Of A Lonely Heart" and "Heart Of The Sunrise," Chris Squire's Rickenbacker bass slid into unison with Steve Howe's precision guitar as talented drummer Alan White provided a polished beat. This performance was the last show of their North American Summer tour. It was my dream come true to witness both Peter Frampton and YES on the same ticket during this phase in their careers. While glancing around the audience, I noticed there was a wide ranging age group that appeared to be spellbound with this performance. 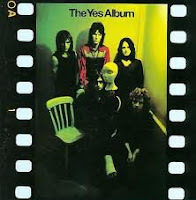 Most were dressed in shorts and sandals while others were browsing at the concession stand and purchasing YES posters and Frampton's new CD titled, "Thank You Mr. Churchill." 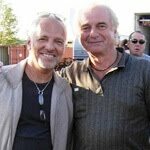 Respectfully, I can truly say that both Peter Frampton and YES epitomizes the essence of an authentic and genuine rock group. Not once during either performance did I hear band members spew-out political hatred. There was no vulgar behavior. None of the performers were covered with head-to-toe body art. No pierced-nostrils or eyelids. No cursing. No drug lingo. Just pure love songs & I miss you songs from two of Rock's finest. From my perspective, this was absolutely the best summer concert of 2010. I hope you agree. Pictured above: Phillip Rauls and Chris Squire of YES.